It’s only been two weeks since Lady J and the Man left. Yet, alas, it is time to say farewell to more wonderful people whose Geneva chapter is coming to an end. Our friends N & A and their cutie pie H.B. are moving back to Nebraska today. 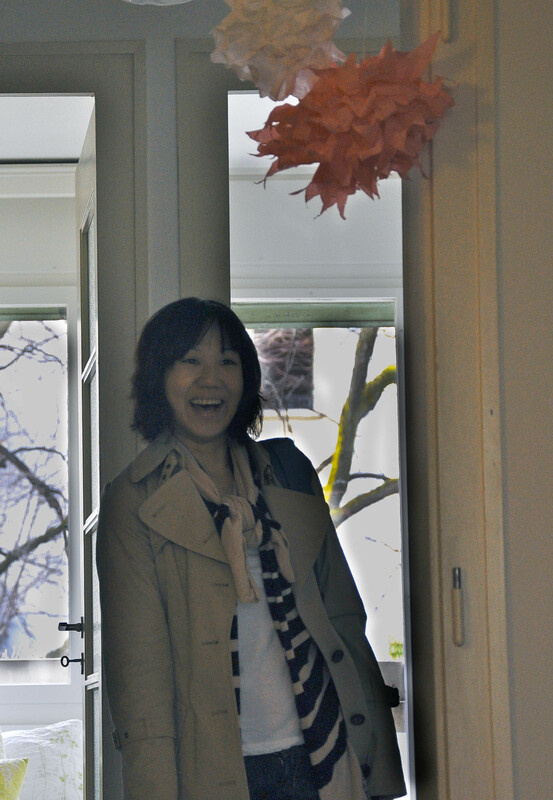 I met N at a welcome coffee at the women’s club in May. We realized we moved to Geneva within a week of each other so made a date for a walk along the lake to compare notes and stories. Since then, I have really treasured having her as a friend. Life got even more fun when she gave birth to H.B. in September, rounding out our girl crew with its youngest member. 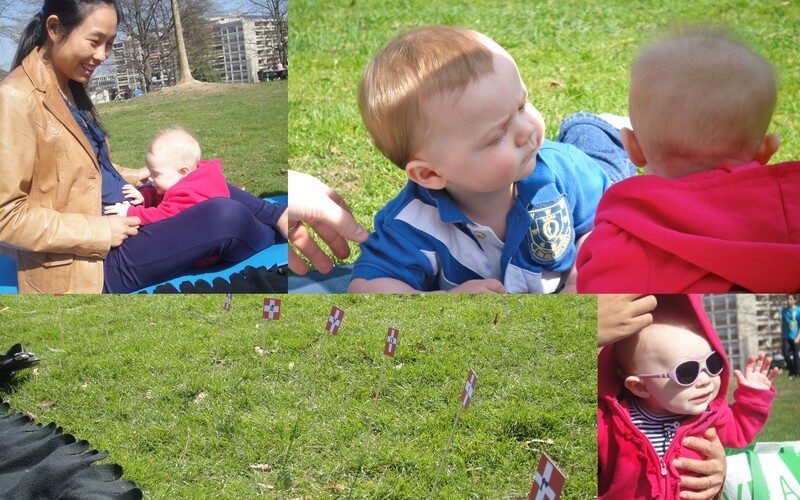 Snapshots of N and H.B. Yesterday, we took advantage of the gorgeous Geneva weather to get together for a picnic with Swiss foods in honor of her departure. It was a lovely afternoon getting to spend some time with the group of ladies before N departed. So, this week, I am grateful for getting to know N, A, and H.B. and the fun times we all had together. We will miss having them so close, but wish her and the entire family lots of luck in their next chapter in Omaha. Switzerland is famous for its cheese delicacies. I thought I would dive into this topic a bit more. Why is cheese from Switzerland better? Many say it’s the cows. Switzerland has a lot of grassland which is hilly and unfit for traditional farming. However, it is excellent for livestock breeding. On a recent tour of the Gruyeres cheese factory, they say that you can taste the flavor of the meadows in the cheese, just like you can tastes the hint of cherry, blackberry, and oak in wine. 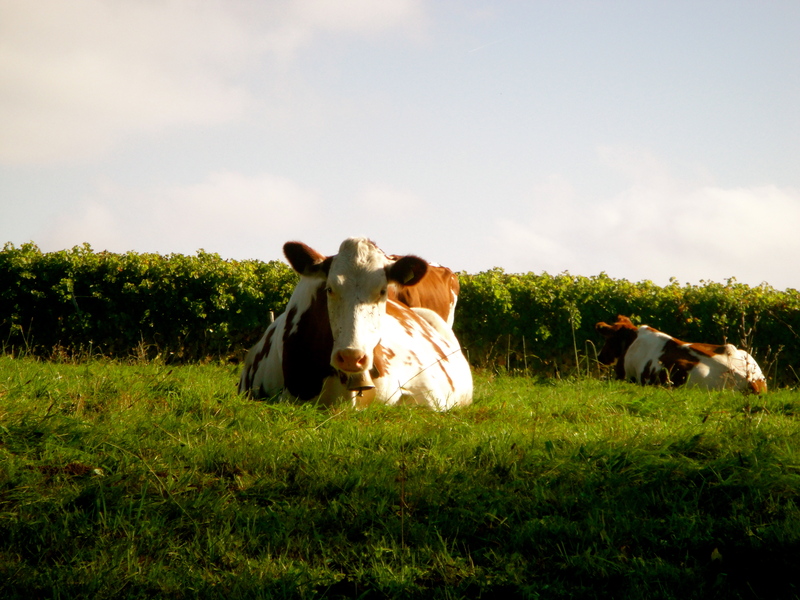 The secret to Switzerland's cheese. Which cheese is Swiss cheese? Well, The Swiss will argue that all cheese in Switzerland is Swiss cheese, because it is made in Switzerland. They aren’t really familiar with the Americanized “Swiss cheese” with holes in it. But this type of cheese Americans commonly know as Swiss is in fact a general term for what the Swiss call Emmenthaler. However, in Switzerland, they have over 450 types, all which they consider Swiss cheese. Where in Switzerland is known for good cheese? Everywhere!! See this map for specific types. 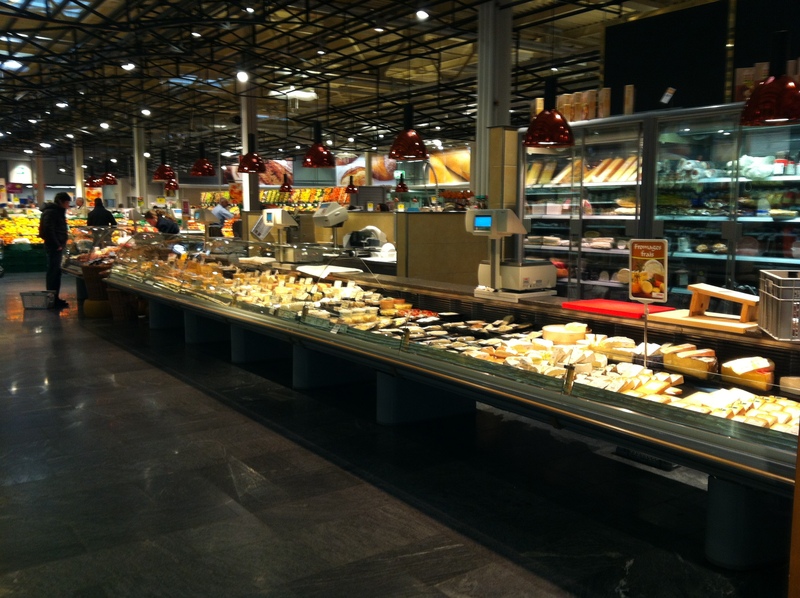 How much cheese do Swiss people eat a year? 47 pounds, compared to 31 pounds by Americans. How do you eat cheese in Switzerland? 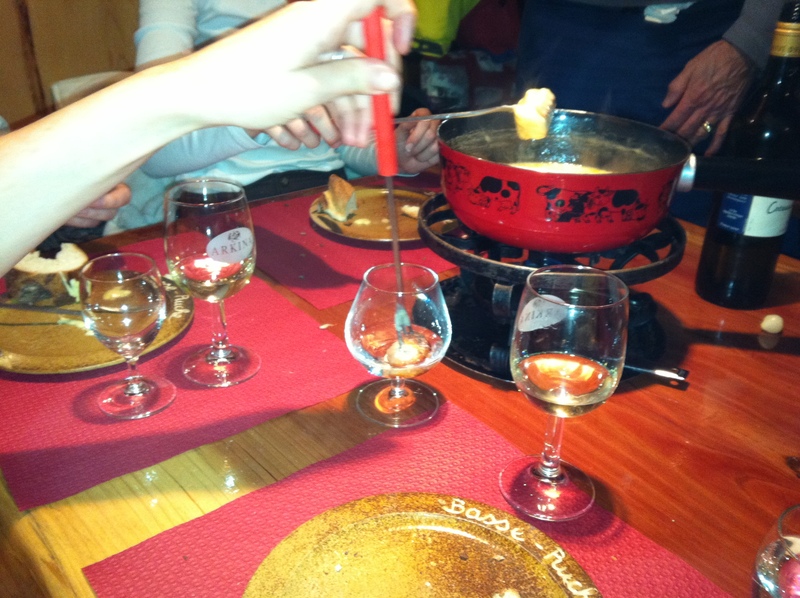 Fondue is a special mélange of Swiss cheese ( Jarlsberg, Emmenthaler, and Gruyere ) mixed with liquors (wine and kirsch). You heat it in a fondue pot and you dip stale bread into it. 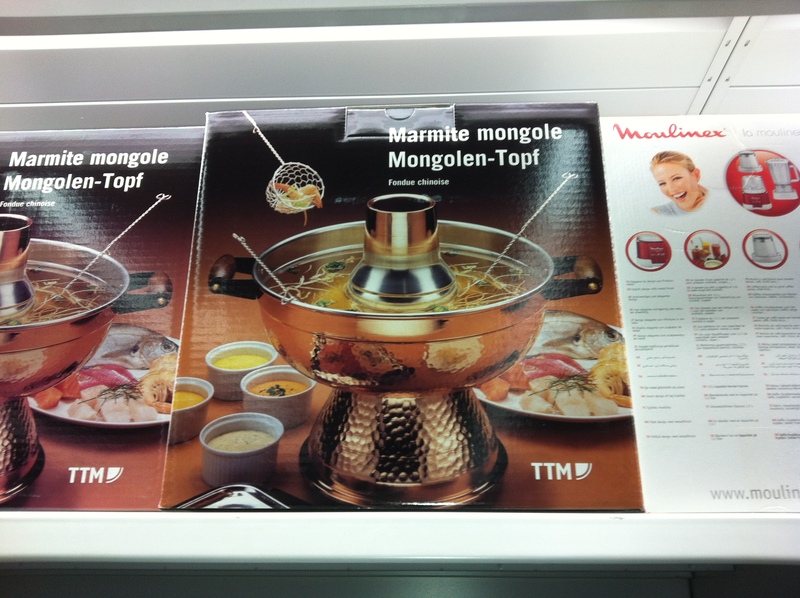 The Swiss are not known for any fondue except for this type. So not oil fondue (bourgignonne) or broth fondue (chinoise) or chocolate fondue (like the kind you see at weddings). However, they do add some variety by serving champagne fondue, and tomato fondue. The first time we ordered fondue, we only ate a tenth. We were so stuffed. The waiter thought something was wrong as I think we ate less than anyone else ever had. Nostalgia. 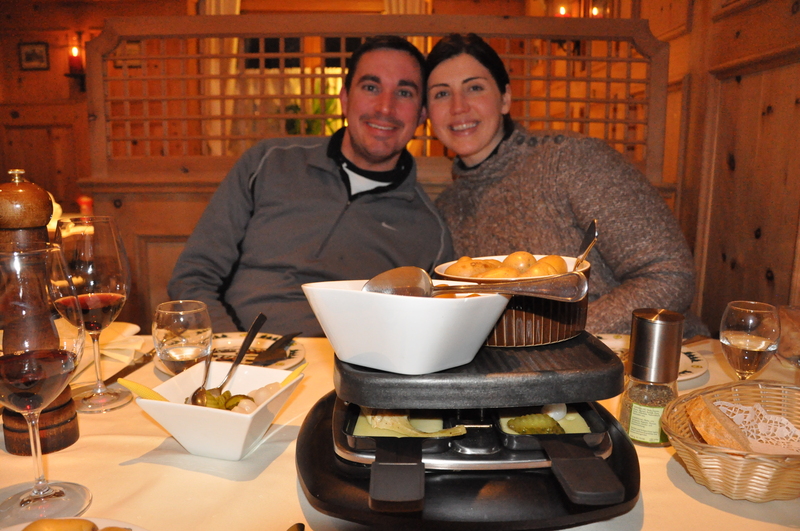 Our first fondue experience in Switzerland at Café du Soleil. We have never reached the bottom by ourselves. However, the bottom is the best part. A told us its like a crispy cheese-it. When we went snowshoeing the gals who sat next to us polished theirs off and offered us some of the bottom. Oh so good. Also, it should be told that true Swiss folks dip their bread into a shot of kirsch first. It is like a cherry alcohol. On the same snowshoeing outing, one of the mean offered us his glass of kirsch to experiment. Not sure if I was a huge fan, but it was very kind for this gentleman to teach how the true Swiss do it. 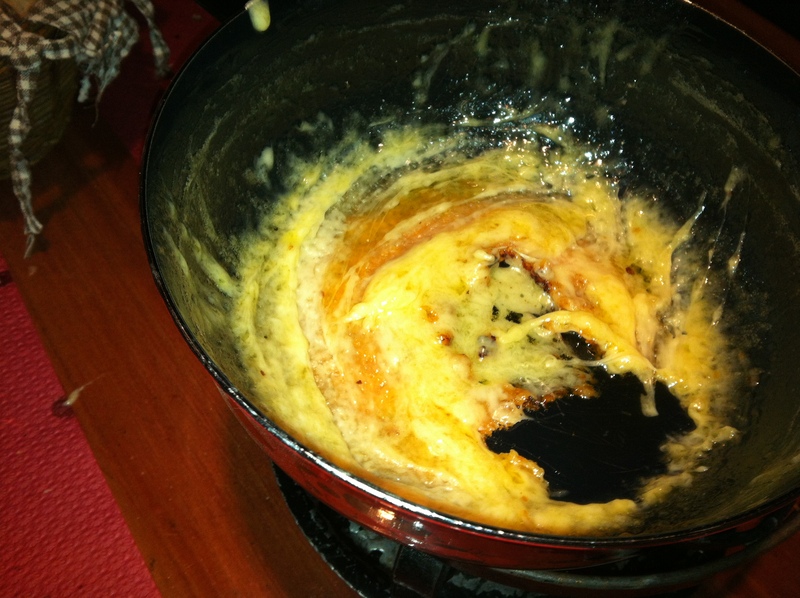 Fondue comes along with responsibility. You should take care that your fork never touches the melty cheese, only your bread. Also, you should avoid your mouth making contact with your fork. This is our favorite cheese dish. In a traditional setting, a huge block of cheese, is heated under a heating element. When it starts bubbling, you scrape off the melty layer onto your plate and eat it with accompaniments which can be dried meats, breads, potatoes, pearl onions, or pickles. 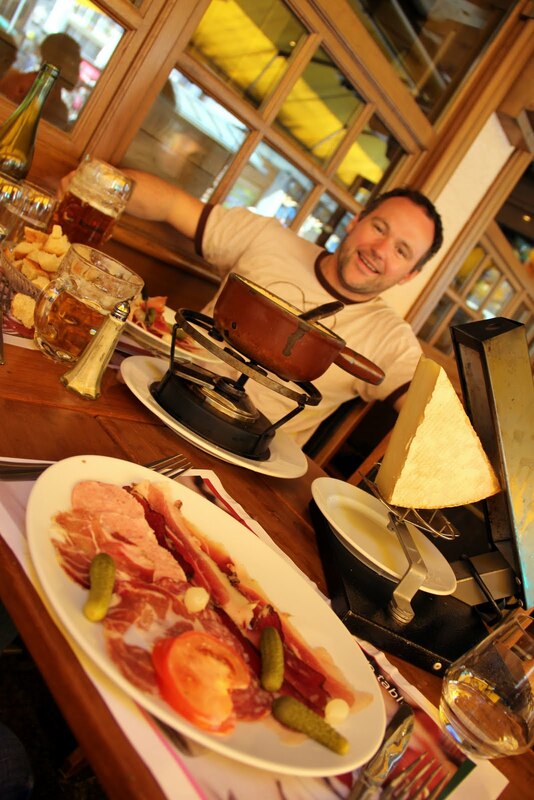 Double dose of fondue and raclette. 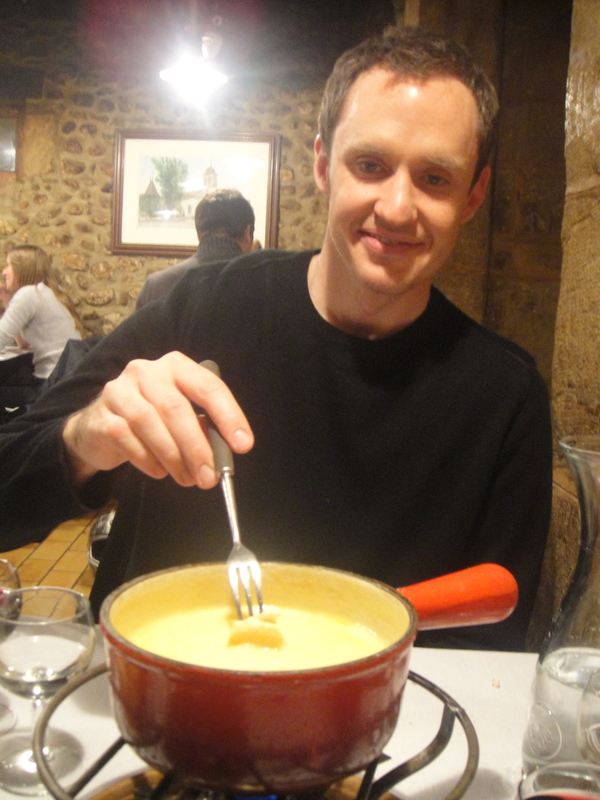 This is raclette Type 1 - Form A - wedge. Me, mesmerized by eating the raclette. This is type 1 - form B - horizontal block of cheese. Pascal learning how to do the scrape. It can also be served two other ways that we have seen. The second way [Type 2] is still a traditional method, but is easier for parties at your home. On a tiered platform, you have a central heating plate. 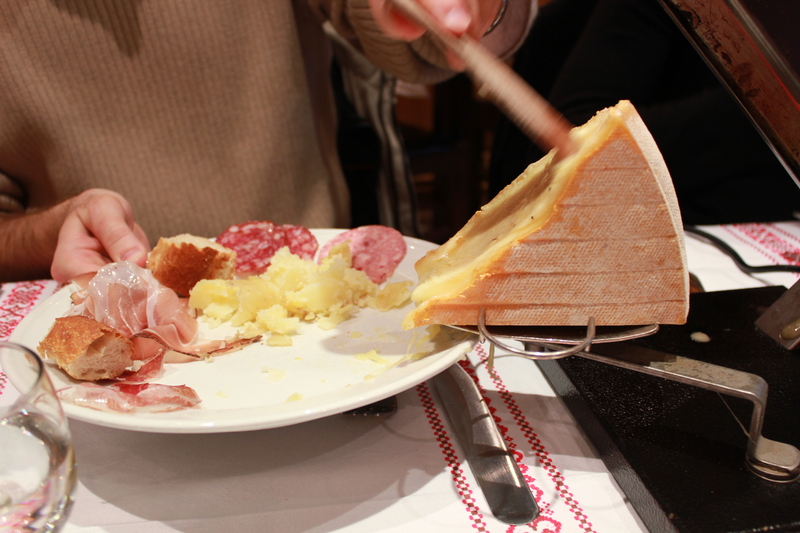 Underneath, you slip individual (usually 6) dishes on which each person has ensembled their own concoction – slice of raclette, perhaps some dried meat. Then, afterwards, they scrape their individual serving onto bread or potatoes on their plate. The Captain and Swiss Miss eating Raclette - Form 2. Notice the little dishes underneath. The top is keeping our potatoes and bread warm. 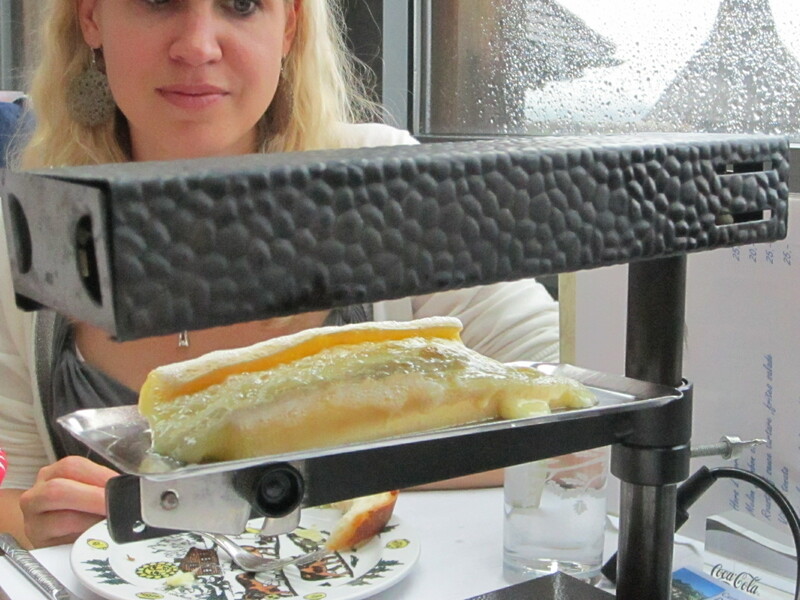 Finally, some restaurants just do the prep in the back and bring you a melty plate of gooey raclette. The taste is the same, but it lacks the fun. Make sure you ask the preparation if you really want a traditional setting. What if you just want to buy it at the store? 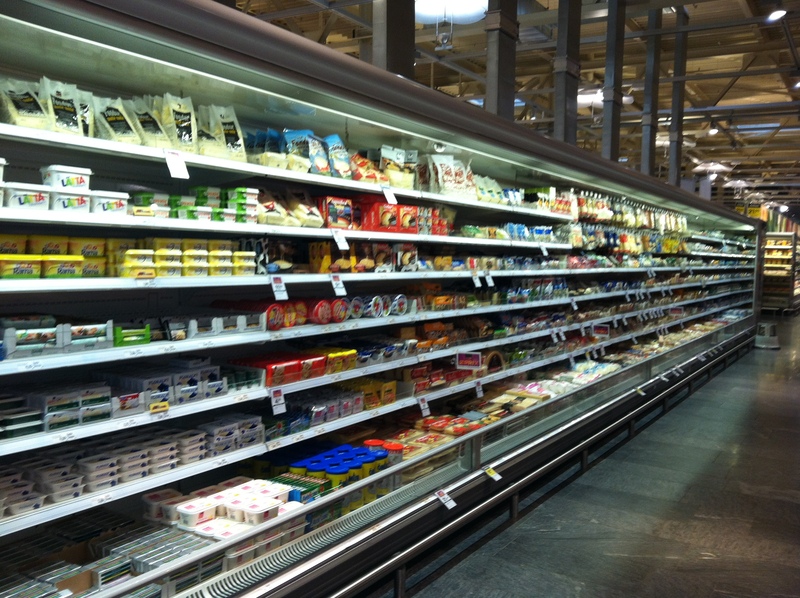 At the grocery store, the cheese section is at least double the size of frozen foods. These people take their cheese seriously. The only other nationality that comes close to Switzerland in the realm of cheese is France. I like French cheese too. Gabe doesn’t because he isn’t a fan of the soft types. "Specialty" cheese section at the grocery store near Gabe's office. Same store. However, in either of these photos, you will not find any cheddar or orange cheese. Nada. You can also buy cheese at the farmers market, or at full-out cheese stores that only sell cheese. I am intimidated still by these places. I’ll buy an occasional known type at the farmers market but want to practice my French a bit more before venturing to the unknown. 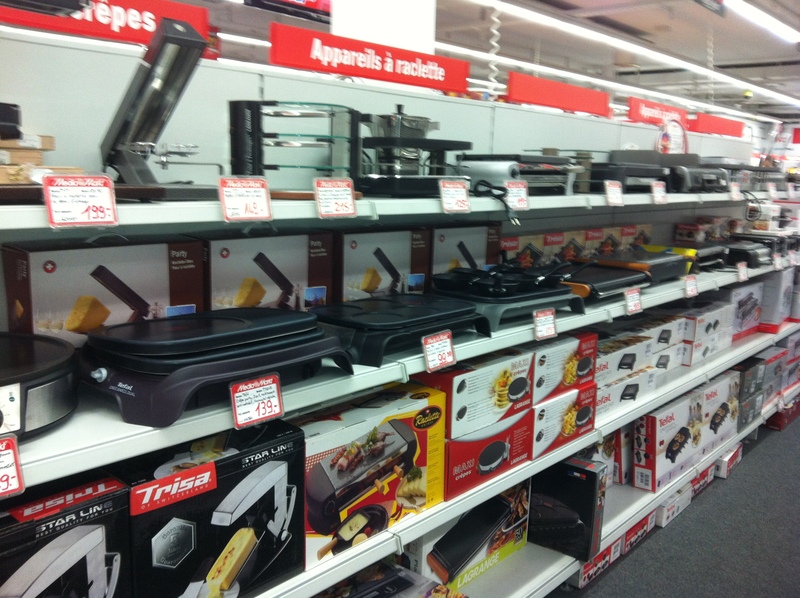 If you want to make fondue or raclette at home, no worries – they sell plenty of cheese heating instruments here. Ski season is officially over for our household. With temperatures warming up, the local slopes are slushy by lunchtime. 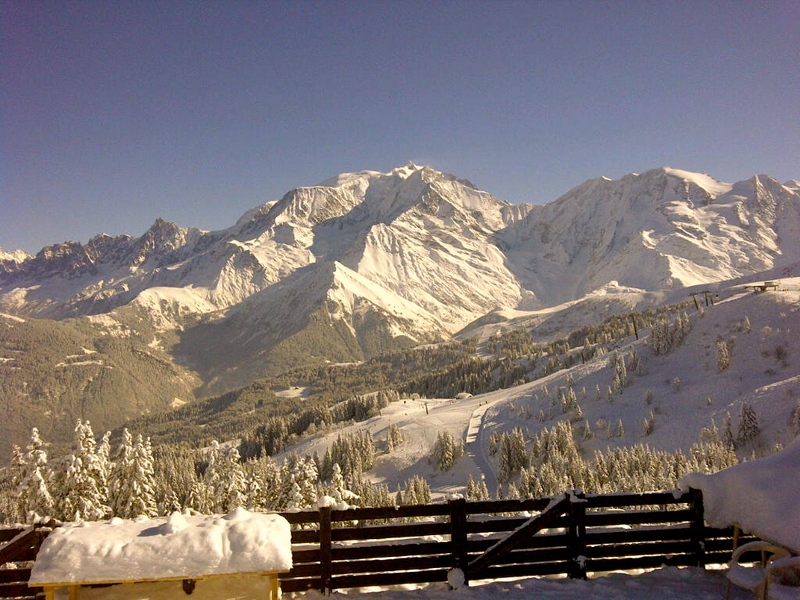 However, we wanted to dedicate a post in gratitude to the Alps and the ski opportunities that we have had this winter. Last winter, it was unusually warm. We heard people say that it only produced about 2 decent snow days and even still, the slopes weren’t ideal. We feel lucky that we have had the chance. Our friend A has major talents with the camera while skiing. I don’t possess such talents as I always have to concentrate on not falling. However, since I have a lot of time in the chair lately, I mixed her video footage with my own to create a recap video of our ski exploits. Au Revoir Ski Season – until next year! We have guests coming this week. It is great to see the familiar faces of our friends and family. But you know what is also a perk? TREASURES! My mother in law is so very sweet to bring a few items we have been coveting. For those expats who have yet to move, I wanted to share our TREASURE list so that you could maybe be smarter than us and bring a supply with you during your move! We can get quasi Mexican products in Geneva. However, they are overpriced and don’t taste the same. While I have gotten over the fact that making a Mexican dinner at home costs 40 CHF, what is missing is enchilada sauce. They do not have it at all here! I have found it is best to buy the cans and put them in Ziplocs and then in my boots and shoes for better success at traveling. Also, recently, my friend N told me you could buy McCormicks packets to save space. I plan to stock up on these when we are back in the U.S. They don’t have the same rules here for baking. Everything I bake turns to S&^^. 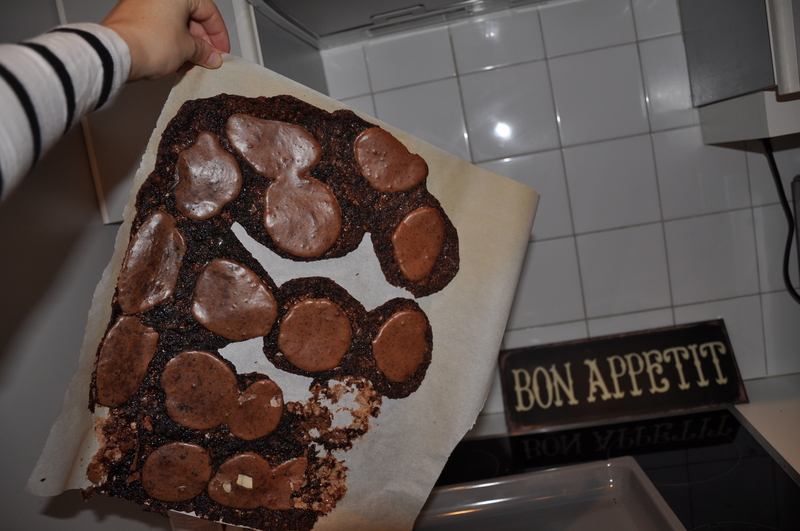 For example, take a look at some cookies I tried to make recently with what I thought was cocoa powder. It wasn’t. I also attempted to use brownie mix from a French grocery store for a cookie exchange. They turned out awful. I didn’t have time to make more. I had to beg people not to take what I had brought…I told them they’d thank me later. So, I recommend that very expat moving to Europe should bring: Baking powder, Baking soda (like Arm & Hammer), Crisco, Canola oil, Karo syrup & Vanilla Extract to help you recreate any recipes you know and love. Better yet, pack a years worth of cake mixes, muffin mixes, and brownie mixes so that you can have easy-to-make treats. They don’t always have similar spices here in Switzerland. Chili powder being a huge example. We love making chili in the winter, so a stockpile of chili powder would be something to bring when you move. I also to use Lipton soup mixes in recipes so I find these helpful to have in Geneva. We aren’t ranch-lovers, but my friends A & A always stock up on ranch powder when they go home. Also, I know a few ladies from Louisiana who stockpile their special Cajun seasonings. You are definitely not going to find anything of that genre in Switzerland. Bring your gloves, magic erasers and other things you are used to. Makeup, shampoo, toothpaste/floss, and razors are 3 times as much here. Bring a two year supply of all your favorite items! –Kashi Almond Flax cereal (Gabe’s favorite). We saw a empty box in a recycling bin at a hostel in Interlacken and actually tried to go on a mission to find it thinking that maybe it was available. Unfortunately, some backpacker probably just brought it from the US. –Stuff for making smores – graham crackers and marshmallows. Not necessary but good to have around! 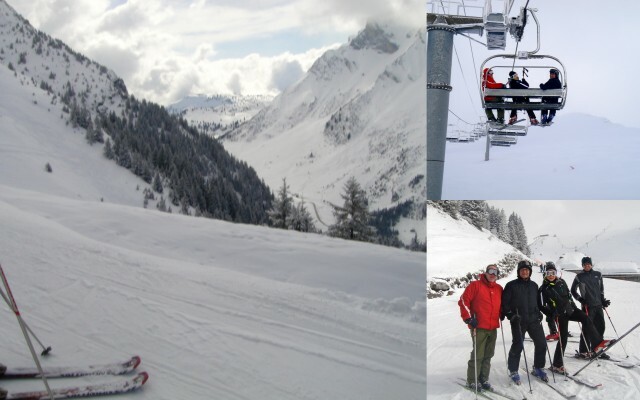 Last week, Gabe had a company outing to La Clusaz, France. The group skied as a team building activity. As the weather warms up, we aren’t sure there will be many more opportunities for skiing. We hear that Zermatt and Chamonix have year-round skiing so perhaps this could be an option. The hardship of Geneva is that it is a transient city – people come, people go. This week we have had to say goodbye to Lady J and The Man. I first met Lady J through email when S found her blog after researching Geneva. We had a blind meet-up at Auer coffee my first week here and she was the first official friend that I had in Geneva. It feels like it was yesterday, but it was last May, 10 months ago. It’s been such a pleasure getting to know her and her husband. They have such style, whether it be in clothing, throwing a sophisticated soirée or in culinary arts. They have an awesome sense of adventure and great recommendations when it comes to travel. 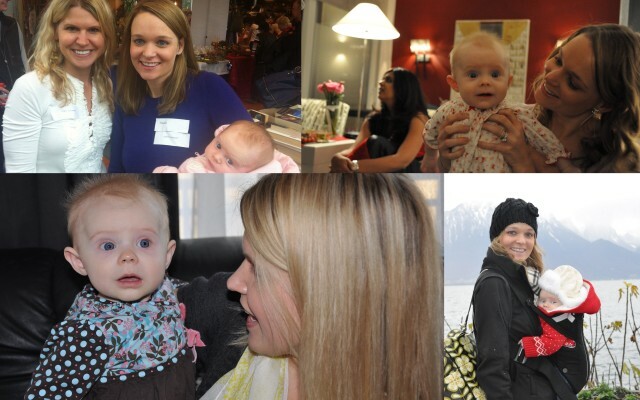 So, this gratitude Friday I am grateful that we have had them in our Geneva story. We hope that we can visit them in Singapore someday soon. Below are some images of a little surprise afternoon get-together we had for Lady J this week. She thought she was dropping in on me to say goodbye but we had other plans in store for a petite fête. Au Revoir, my friend. May you have a Bon Weekend on your flight back home! Hiding in anticipation of Lady J's arrival. All the ladies enjoying our afternoon of sweets. We'll miss you Lady J! 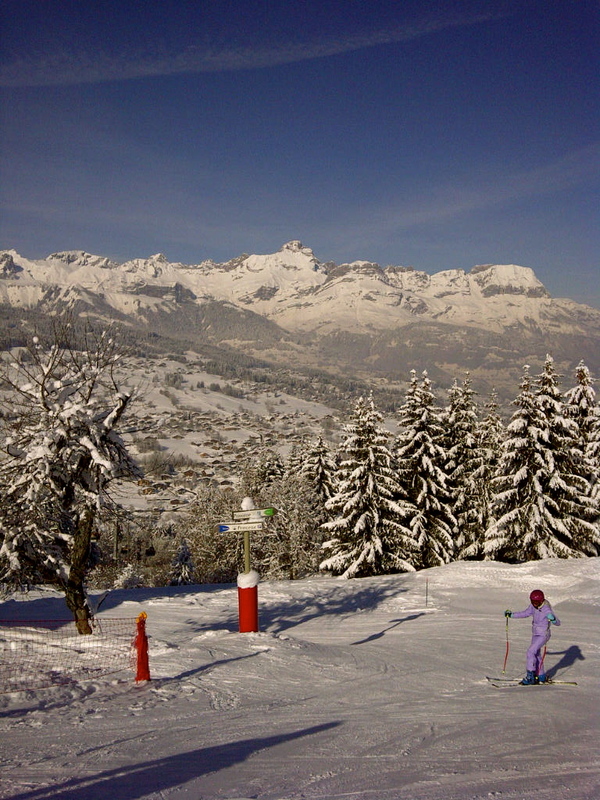 Gabe went skiing in Mègeve a few weeks ago when we were having our Arctic temps. Luckily, two fellows from Geneva accompanied him as I was worried he would freeze to death in the -20 C temps. While they went for just the day (only about an hour’s drive from Geneva), we have heard good things about the town of Megève from friends. Hopefully, we’ll be able to return and perhaps stay in the town next year.